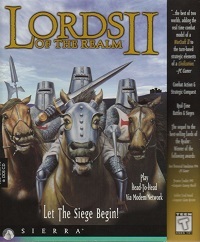 Lords of the Realm II contains 24 different game maps. Some can be played with 4 other (AI) players, others are designed for less players. The Lords of the Realm II Siege Pack expansion contains an additional 20 new maps. England: Balanced for 2-5 players, this is the standard game map. All starting counties have about the same number of fields. Two counties have the advantage of having islands that can't be pillaged. The best counties to hold here are on the western side of the country because limited access makes them more defensible. Scotland: This is a small map for up to 5 players. With only 10 counties, some of which have very limited resources, life here is appropriately nasty, brutish and short. Strategically, this map is a figure 8 even though cross-country movement is necessary to cut across the center. The key counties to hold are the ones in the center of the map which divide the country in half. Ireland: Balanced for a 4 player game, a fifth player will have to fight for space. Each starting county is adjacent to two neutral counties. However, all of the neutral counties can be easily reached from at least two starting counties. The fifth player starts in the middle and must fight his way out. Try to gain control of the neutral counties on either side of your starting location and avoid early wars. France: Smaller than modern day France, the northern and eastern parts of the country were controlled by the Holy Roman Empire. Designed as a 5 player map, each player has access to two neutral counties which will provide all resources and act as a base from which to seek the throne. Starting in the Royal Demesne is most challenging because it is surrounded by enemies. However, it also has the best access to neutral counties. Germany: This is the Holy Roman Empire and includes territory in modern France, Italy, Austria, etc. The inner ring of counties contains all of the important crossroads and enables access to the outer counties, like spokes on a wheel. The outer counties contain the best resources but have the least access to other counties and see very few merchants. Italy: As a peninsula, this country imposes a lineair strategy: fight from one end to the other. If you are unfortunate enough to start in the center, head either north or south while maintaining friendly relations with the players facing your other border. Avoid fighting on both fronts simultaneously. Europe: Best for 2-5 players, this map will always provide an interesting game. Many of the neutral counties here can only be reached by passing through enemy territory. Defend your home country well and gain control of any neutral counties in your rear areas. France and Germany, in the center of the map, will be hard pressed to avoid an early demise. Crusades: Many counties divide this crescent shaped map in half. You will be fighting from one end to the other. Regardless of where you start, secure the counties in either Greece or Africa first and then turn back and fight for the center. Don't allow players with a single front to remain at peace for too long. Africa: This is an outstanding map for any number of players. French North Africa is by far the most strategically important county because it contains four other counties within it. However, it is also one of the most difficult to hold on to, especially with army foraging on. It has few fields which are inconveniently spread out and easily pillaged. Once you gain control of this county, make an effort to build a strong castle and, with foraging on, immediately start shipping food in. If an opponent controls it, make every effort to either capture it or make it revolt: his remaining counties will be non-contiguous and will turn neutral. India: This is an interesting medium sized map for up to 5 players. The northern counties have an abundance of fields but no resources. The counties above them have resources but few fields. The central locations are well placed to start but are inconvenient to capture. To conquer the western side of the map, you must capture a county accessed from the east and vice versa. Starting in the south is probably safest. China: Using the province borders of the Northern Sung dynasty and a road network based on the main trade routes of the period, this map is historically accurate. Each starting area has access to at least two neutral counties which provide the necessary resources to form a solid base. Pay attention to the strategic possibilities of off-road movement. Unlike other maps, there are no rear areas that can be easily defended. Every county can be invaded from at least two others. Ching His-Tung county, the capital, is similar to the Royal Demesne on the France map: it is centrally located and surrounded by enemies but also has the best access to neutral counties. Jigsaw: This fictional map is exceptionally well balanced for 2 or 4 players. Adding a 5th will make it very bloody (and challenging for the 5th player). Each player can control three counties as a base and then fight for control of the center. Once you own the center, defend it well and then expand into another quadrant. If an enemy controls the center, make sure he doesn't hold it for long. Rose: This small fictional map for 2-5 players works best with 5. Each player has only his home county and access to the central county. However, since the home counties are adjacent to one another, it is not necessary to hold the central county to increase the size of your domain. With such a small map, plan a quick conquest rather than a long campaign. Starting with strong castles will lengthen the game somewhat. Bullseye: Two concentric rings of counties with three concentric rings of roads makes this an entertaining geometric map. Evenly balanced for 2 or 4 players, with the 5th player appearing in the middle, this map always provides a lively, entertaining game. Control of the central county will allow conquest of territories on opposite sides of the map. It will also allow conquest of counties that divide an opponent's territory in half. Crossroads: Another evenly balanced 2 or 4 player map with the 5th player in the center. Here, control of the center is essential because it separates each of the other counties. If you can't control the center, try pillaging your opponents. Eliminating other players by making their counties revolt is almost as good as conquering the county. Rorschach: Spend a few moments studying this map before playing it. The northwest and southeast are easiest to hold but are difficult to expand from. The northeastern counties are interconnected and will probably form the largest initial kingdom. The southwestern counties are actually the strategic center of the map and the most dangerous area to start in. Centreville: This is a medium sized fictional map with seven counties forming an arc around a central country. In a 4 or 5 player game, there will be a scramble for neutral counties, as there aren't enough to go around. The central country is, of course, the most important and with five players someone will have the difficult task of defending it. Quaintville: Very small 2-4 player map. The center is not nearly as important here as on other maps of this type. All counties are adjacent to all other counties so it is impossible to divide a kingdom in two. Also, since the center is so inaccessible, it is faster to move around it than through it. Pretzelland: Specifically designed for 5 players, each player will have two natural enemies. However, with nearly all counties contiguous, it is possible to fight anyone and still be able to retain most captured counties. Note that some counties are adjacent even though it is not possible to move between them. New England: Massachusetts is the key to victory on this map. Without it you won't be able to control more than half of the map. This small map will be quick and bloody with any number of players. Equalizer: This is a perfectly balanced 2 or 4 player map. All players have equal resources and access to all other players. Be careful to defend against all opponents: diagonally opposed counties are not contiguous but a surprise attack can cost you your home base even if the conqueror can't retain his prize. Rubix World: Also perfectly balanced for 2 or 4 players, this is a medium sized map which will take slightly longer to play. Note that counties which are diagonally adjacent are not contiguous. There are limited sources here: if you can't capture counties containing iron and stone you will have to purchase them. Pentagon: This is a perfectly balanced 'donut shaped' 5 player map. Each county is contiguous only with its nearest neighbors. Try to form an alliance with a player on the opposite side of the map and get him to attack the county adjacent to both of you. You can join in this attack when your other border is at peace (let your ally do the fighting while you retain the county). If at war with your other neighbor, you will be able to concentrate on him as long as your ally can protect your rear. Yin Yang: Balanced for 2, 3 or 5 players, this medium sized map does not have enough neutral counties for everyone. There are plenty of resources for weapons, but stone is in short supply.